This pop-up mini-circle demonstration took place at the intersection of Orchard Road and Winslow Road from September 15 to October 1, 2017. A user-experience survey was issued, and data is now being reviewed. Residents from Orchard Road and other areas of Newark (known as the Friends of Newark Neighborhood Streets) initiated this demonstration project and have led its design and implementation with support from the City of Newark and BikeNewark. The City’s Traffic Committee had given final approval for this temporary project on Tuesday, August 15, 2017. In preparation for this demonstration, the City had tested a similar set-up with one of its refuse trucks. On September 18, the mini-circle was tested satisfactorily by one of Aetna Hose Hook & Ladder’s largest fire trucks. In 2006, the City formed a Newark Traffic Calming Ad Hoc Committee to expand on the 2001 Old Newark Traffic Calming Plan. The Ad Hoc Committee recommended the use of “pilot” and/or temporary projects central locations for interested citizens to become familiar with traffic-calming techniques prior to pursuing them in their own neighborhoods. The purpose of this citizen-organized project is to give residents and the City of Newark an inexpensive opportunity to explore a traffic-calming device at the intersection of Orchard Road and Winslow Road via a temporary infrastructure project. 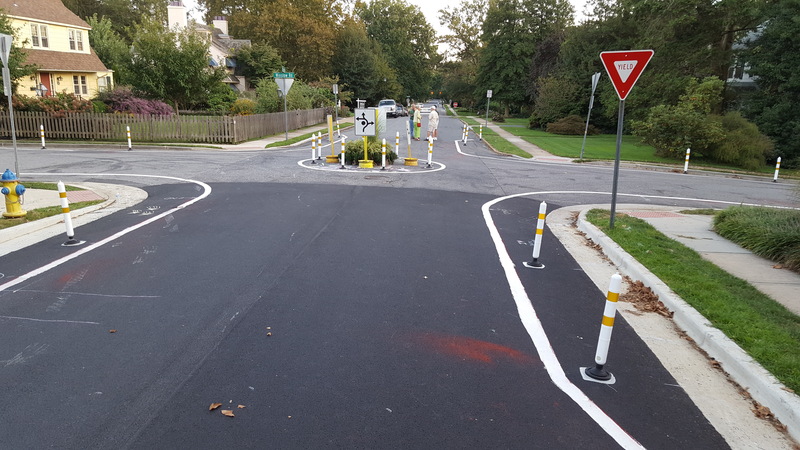 There are many other areas in Newark that might benefit from this traffic-calming approach; consequently, this project will also be an opportunity for residents throughout Newark to become familiar with traffic mini-circles and consider them for other neighborhoods streets with conditions. Additionally, this traffic-calming measure will improve bicycling conditions along Orchard Road. The 2014 Newark Bicycle Plan identifies Orchard Road as an important north-south segment in its proposed low-stress bicycle network. A low-stress network of bicycle facilities provides safer conditions for both bicyclists and pedestrians. The project consists of a temporary “pop-up” mini-circle located at the intersection of Orchard Road and Winslow Road. 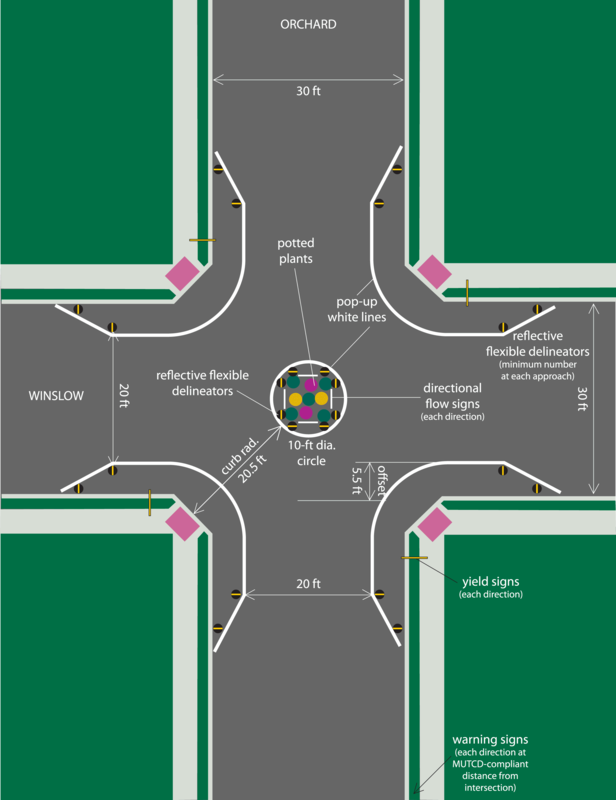 In addition to the mini-circle, the project includes two “pop-up” bump outs at each of the four corners of the intersection to encourage safe driving behavior and to facilitate pedestrian street crossing. A proposed second mini-circle at the intersection of Orchard Road and Sunset Road has not been constructed due to resource constraints. Based on testing performed by the City of Newark’s Department of Public Works & Water Resources to ensure that the final design of the temporary facility will accommodate turning radii of typical vehicles that travel through this intersection, a mock-up of the intersection using cones was created by the Department and tested with a city refuse truck. Based on the results of this test, the project will likely consist of a 10-ft.-diameter circle placed in the center of the intersection. In addition, two 10-ft. x 3-ft. bump-outs will be constructed at each corner (eight total). Changes to these dimensions might be made during the installation of the infrastructure as deemed necessary by City staff. A painted arc between each set of bump-outs will be applied to visually connect the bump-outs providing additional traffic calming and pedestrian security. Painted contours and off-set flexible delineator posts will be used to mark the perimeter of the mini-circle and bump-outs. The interior of the circle will be decorated with potted plants using a fall concept. The landscape design will be prepared by an Orchard Road resident. *Members of the project team who have participated in at least one planning meeting are listed here. There are several other neighborhood residents who have been included on all emails that pertain to the planning of this project.